"This dip goes great with everything, but it is always a big hit at parties, especially when served with hummus, tabouli and pita bread. If you're a big fan of tahini, add more according to your taste. Enjoy!" 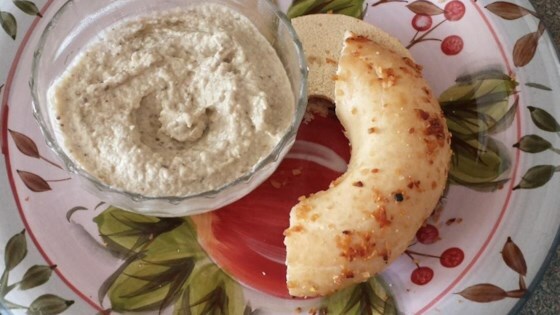 While many Baba Ghanoush recipes do not call for yogurt, it is not that uncommon either. I enjoyed this dip. However, being a garlic lover, I did add a bit more garlic. This recipe was a nice surprise given I don't really like eggplant or yogurt. It's creamy, yummy! I pureed the eggplant for a smoother texture. I omitted the teriyaki sauce. We made it without the yogurt at first but after tasting it, decided to add the yogurt. Quite delish! I used 4 cloves of mashed garlic because we like garlic. I didn't like this much. All I can taste is the eggplant and I even added more salt and teriyaki sauce. Will not make a again. It was bland but made a TON. What a waste of eggplant. I added a little more salt than was called for - this is a great party dip for either bread or veggies. Very good. I did only one eggplant and skipped the teriyaki. I will definitely use this as a base recipe again. Oh I also put the eggplant in the blender to make it smoother.